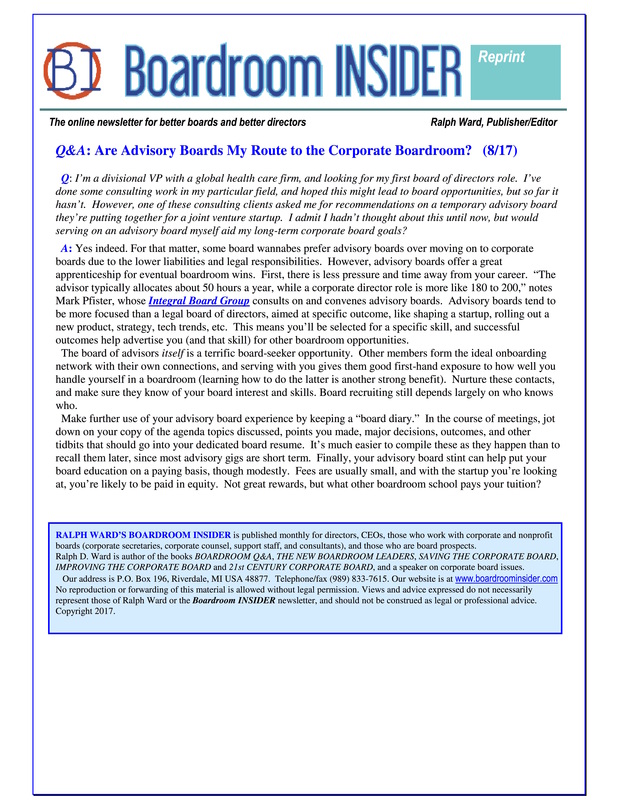 Are Advisory Boards My Route to the Corporate Boardroom? Q: I’m a divisional VP with a global health care firm, and looking for my first board of directors role. I’ve done some consulting work in my particular field, and hoped this might lead to board opportunities, but so far it hasn’t. However, one of these consulting clients asked me for recommendations on a temporary advisory board they’re putting together for a joint venture startup. I admit I hadn’t thought about this until now, but would serving on an advisory board myself aid my long-term corporate board goals? A: Yes indeed. For that matter, some board wannabes prefer advisory boards over moving on to corporate boards due to the lower liabilities and legal responsibilities. However, advisory boards offer a great apprenticeship for eventual boardroom wins. First, there is less pressure and time away from your career. “The advisor typically allocates about 50 hours a year, while a corporate director role is more like 180 to 200,” notes Mark Pfister, whose Integral Board Group consults on and convenes advisory boards. Advisory boards tend to be more focused than a legal board of directors, aimed at specific outcome, like shaping a startup, rolling out a new product, strategy, tech trends, etc. This means you’ll be selected for a specific skill, and successful outcomes help advertise you (and that skill) for other boardroom opportunities. The board of advisors itself is a terrific board-seeker opportunity. Other members form the ideal onboarding network with their own connections, and serving with you gives them good first-hand exposure to how well you handle yourself in a boardroom (learning how to do the latter is another strong benefit). Nurture these contacts, and make sure they know of your board interest and skills. Board recruiting still depends largely on who knows who. Make further use of your advisory board experience by keeping a “board diary.” In the course of meetings, jot down on your copy of the agenda topics discussed, points you made, major decisions, outcomes, and other tidbits that should go into your dedicated board resume. It’s much easier to compile these as they happen than to recall them later, since most advisory gigs are short term. Finally, your advisory board stint can help put your board education on a paying basis, though modestly. Fees are usually small, and with the startup you’re looking at, you’re likely to be paid in equity. Not great rewards, but what other boardroom school pays your tuition? RALPH WARD’S BOARDROOM INSIDER is published monthly for directors, CEOs, those who work with corporate and nonprofit boards (corporate secretaries, corporate counsel, support staff, and consultants), and those who are board prospects. Ralph D. Ward is author of the books BOARDROOM Q&A, THE NEW BOARDROOM LEADERS, SAVING THE CORPORATE BOARD, IMPROVING THE CORPORATE BOARD and 21st CENTURY CORPORATE BOARD, and a speaker on corporate board issues. Our address is P.O. Box 196, Riverdale, MI USA 48877. Telephone/fax (989) 833-7615. Our website is at www.boardroominsider.com No reproduction or forwarding of this material is allowed without legal permission. Views and advice expressed do not necessarily represent those of Ralph Ward or the Boardroom INSIDER newsletter, and should not be construed as legal or professional advice. Copyright 2017.